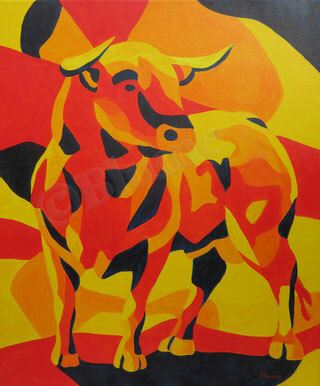 A fiery bull in the heat of the day. Someone on Instagram suggested painting a bull. First, I tried to figure out which posture best fits my intentions. Which colours should I use in which combination? The bull should come across as powerful and soomhow majestic and that one had better not irritate it. With this posture and the warm - or rather hot .-) - colours i wanted to portray the temperament of a Spanish bull in the heat of the day.